Computer manufacturers launching hardware alongside Microsoft’s Windows 7 release Oct. 22 are blurring the line between netbook and notebook. When the first netbooks – sometimes called ultraportables or mini laptops – hit the market, it was easy to distinguish them from traditional laptops. The screens were much smaller. The keyboard size was shrunken to less than full-size. The operating system (OS) was Linux and sometimes Windows XP. But with the launch of Windows 7, the distinctions seem to be melting away. PC manufacturers are bridging the gap between form factors with larger, more powerful netbooks, and leaner, more budget-conscious laptops. Many are embracing Microsoft’s latest OS for these mobile hybrids. Case in point is Toshiba’s Satellite T-130 notebook. Even the manufacturer won’t label its form factor. The laptop has a 13” screen, but no optical disc drive. It can support up to 4 GB of RAM and a 400 GB SATA hard drive. It is capable of connecting wirelessly to a 3G internet connection, or to a Wi-Fi network. It’s powerful enough to be a primary PC for many users, but it is portable too, Senechal says. Dell Canada is still making the distinction between a netbook and a notebook. The manufacturer defines the difference mostly based on the type of processor. 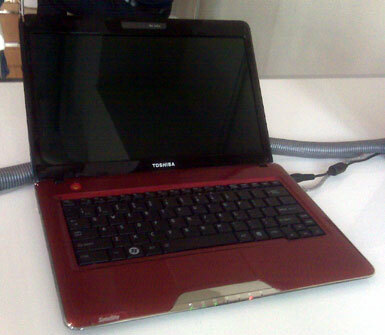 Intel Atom processors are used for netbooks and a step-up to low-voltage Intel Celeron for smaller notebooks. 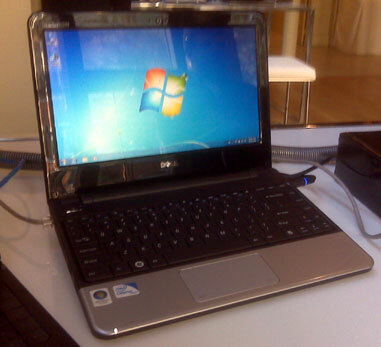 There’s a couple other hallmarks of the netbook, explains Greg Shelly, brand manager at Dell. Dell considers smartphone computing a three-minute usage experience, netbooks a half-hour experience, and laptops a three-hour experience. Dell’s Inspiron 11z netbook blurs the line between form factors with an 11” display but with a Celeron processor inside. With 2 GB of RAM, a 250 GB hard drive and a six-cell LI-ON battery, it boasts better performance and battery life than most netbooks. Windows 7 is a boon for Dell’s line of portable computers, Shelly says. The computer maker is switching to the new OS across the board. “We’re seeing a performance improvement across the same hardware set,” he says. Netbooks are becoming more powerful as the market responds positively to the new form factor, says Tim Brunt, senior analyst, personal computing at IDC Canada. The Toronto-based consulting firm saw netbooks perform well at the end of 2008 despite the recession. A total of 95,000 netbooks (IDC calls them “mini-notebooks”) were sold in the fourth quarter and 20,463 went of those went to businesses. Netbooks were the only growth area in computer sales, with desktops and laptops both dipping in sales compared to the previous year. Another example of the blurring line between netbook and notebook is Hewlett Packard’s DV2. A 12” screen has a 1.6 GHz AMD Athlon Neo processor, 4 GB or RAM, a 320 GB hard drive and a ATI Mobility Radeon HD 3410 graphics card with 512 MB of dedicated memory. Similarly, the LG T380 has a 13.3” LED screen and is powered by an Intel Pentium 1.3 GHz professor with 2 MB of L2 cache, 3 GB of RAM, 320 GB hard drive, and an integrated Intel GMA 4500M graphics chipset. Other hardware vendors are also timing the release of portable PCs either at Windows 7 launch date or at around the same time.